This entry was posted in INTERNATIONAL DANCE FESTIVAL-SILICON VALLEY and tagged CA, Inernational Dance Festival@Silicon Valley, Leslie Friedman, mountain view california, payment, registration, Summer Dance Festival, The Lively Foundation on June 29, 2016 by Leslie. San Francisco Opera’s performance of Jenufa by Leos Janacek was spectacular, June 28, at the SF Opera House. There will be one more performance of this powerful, emotion grabbing, musically fascinating work. It’s Friday, July 1; don’t miss it. The SF Opera Orchestra, conducted by Jiri Belohavek, has never played better. The voices of the singers were stunning. Not content with making beautiful sound, the singers made their sound perfectly fit the characters they presented. 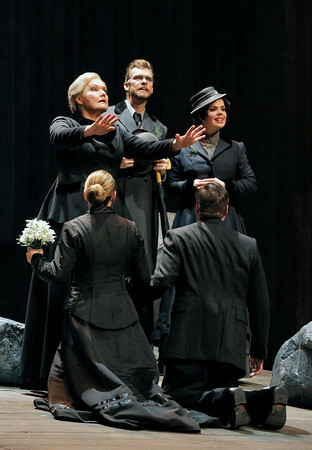 Karita Mattila, pictured above, performed the role of Kostelnicka Buryjovka. From the first moment she is seen onstage, her presence becomes the tragic center of action. Her voice, suffused with knowledge and emotion, reaches into every listener. A brilliant opera star, this is her onstage debut in this role (she performed it in concert with the Czech Philharmonic Orchestra conducted by Jiri Belohavek, in April). She has made it her own. Czech composer Janacek began work on Jenufa, in 1895. It was premiered in 1904, in Brno, and in Prague in 1916. Janecek came from a village much like the one in his opera. 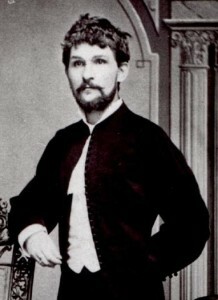 He collected and studied music and songs from Moravia, his home region, as well as its speech patterns and expressions. In Jenufa, the characters live in a tightly knit community, isolated from outside culture. Jenufa is a young woman who loves Steva, a handsome man who owns the mill and is also a drunk and a flirt. At the beginning of the opera, she reveals that she is pregnant and prays that Steva will not be drafted but will marry her, saving her reputation and her life. Laca, another villager, has loved her all his life, but she is blind to him, especially now. The village does not offer a lot of options for an intelligent young woman. She teaches others how to read, but she cannot read the facts that Steva will only bring her trouble. Steva brags to his friends that all the girls want him. 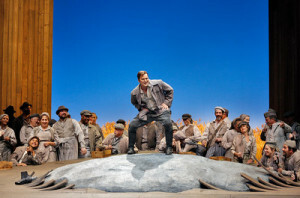 Tenor Scott Quinn as Steva was both completely self-centered and too frightened of responsibility to have anything to do with Jenufa and her problem. In excellent voice, he performed splendidly enough to earn boos at the curtain call. He was also frightened of the Kostelnicka, village sacristan, who demanded he spend one year sober before she could let him marry Jenufa, her stepdaughter. At a loss for what to do, Jenufa hides in her stepmother’s home to have her child. Only 8 days after the birth, her stepmother has invited Steva to visit in order to convince him to marry. He refuses. In a fit of jealousy, Laca cut Jenufa’s face. She is less beautiful now and has a baby. He will marry the Mayor’s daughter instead. Laca visits and declares his love again. Desperate, the Stepmother finds a way to make this match work. Lovely Soprano Malin Bystrom, making her debut in the role as Jenufa, experiences changes through the events of the opera. An international star, she certainly must keep Jenufa in her repertory; she was exquisite. When she enters in Act I, she is a vision of happy youth. Her movements suggest a sought after young woman whose love is fulfilled. She enters through the bright sunlight of the upstage image of ripe grain. However, the set is built so that two high walls nearly connect to each other at the point where the outside world is seen. Production Designer Frank Phillipp Schlossmann did a wonderful job of creating the enclosed, separate world of the villagers. He also uses the visual theme of stones to match the frequent mention of stones in the text. There is a possible millstone, mysterious and extra large, on stage in Act I. In Act II a stone takes up the entire interior of the Stepmother’s home. When we see Jenufa after the birth, she is weak, frightened of what will become of her, and yet loves her baby. The world of the opera might seem as distant and peculiar to 21st century San Franciscans as life on Mars. Public shame and hopelessness, real and powerfully portrayed, are the future for Kostelnicka, Jenufa and the baby. Laca agrees to marry Jenufa. Sung with great success by tenor William Burden, Laca also goes through changes from angry, violent outcast, to pacified, hopeful helpmate. This is where the internet tradition of “spoiler alert” should appear in this Hedgehog Highlight. 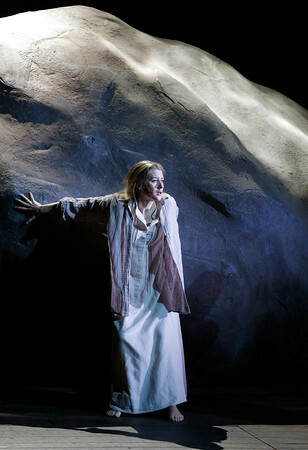 Terrifying events will occur: the Kostelnicka confesses to her crime, the crowd tries to stone Jenufa using Designer Schlossmann’s very believable, rugged decor. Out of this terror, there is something nearly like a happy ending. In classical theater, it’s a comedy if it ends with a marriage. Order and harmony return that way. While commentators have noted that the Kostelnicka confesses in order to spare her beloved stepdaughter and because she recognizes that she acted as much for herself as for Jenufa, for this observer it is necessary to note that none of the tranquility that is achieved for Laca and Jenufa could have happened without the actions of the suffering Kostelnicka. The cast was wonderful. It was a great night for music, a triumph for theater. Do not wait; buy your tickets now. The loving sinner Stepmother, blesses the nearly happy couple before the truths are found out. For another Hedgehog observation of Karita Matilla, please go to http://www.livelyfoundation.org/wordpress/?p=758 Ms Matilla made her debut with the San Francisco Symphony, in the Beethoven Festival, June 17, 2015, singing Ah! Perfido Scene and Aria, Op. 65. In this Jenufa post, photos except the unattributed ones of Ms. Matilla and Janacek, are ©Cory Weaver/SF Opera. 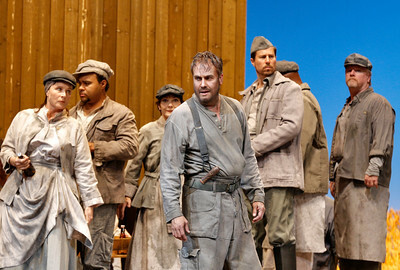 This entry was posted in Hedgehog Highlights and tagged Jenufa, Jiri Belohlavek, Karita Matilla, Leos Janacek, Malin Bystrom, San Francisco Opera, San Francisco Opera Orchestra, Scott Quinn, William Burden on June 29, 2016 by Leslie. Don’t miss the great deals for Early Bird registration. The deadline is June 30. There are meaningful discounts available for all the IDV@SV workshops and classes. Take all five classes in Full Day of Dance© for only $60. You cannot beat that. Take the Monday-Friday Contemporary Technique & Repertory class AND have the opportunity to perform; sign up early and save $30. You could use that $30 for the Physical Comedy workshop. Physical Comedy offers half price for a second student: $30 for one person and only $15 for a companion. This offer will continue through the summer. How can you pass it up? Megan says you will learn slaps and falls! Has anyone else offered to teach you slaps and falls at such a low price? I seriously doubt it! Register now; just scroll down a little to find the reg form. You can copy it and email it to livelyfoundation@sbcglobal.net So much dance, beauty and fun awaits you!!! but the Early Bird won’t wait. This entry was posted in INTERNATIONAL DANCE FESTIVAL-SILICON VALLEY on June 25, 2016 by Leslie. James Conlon led the San Francisco Symphony in a bracing, thought provoking, thoroughly satisfying performance, June 11, at Davies Symphony Hall. The varied program included Sinfonia da Requiem, Op.20 (1940), by Benjamin Britten; Piano Concerto No. 22 in E-flat Maj., K. 482 (1785), by Mozart; Symphony No.8 in G maj., Op. 88 (1889), by Antonin Dvorak. In addition to great works from the 18th, 19th, and 20th centuries, the selections offered a range of emotions and connections to human experience. The SF Symphony seemed completely in synch with Maestro Conlon. Bravo Bravo Bravo–one for each performance. 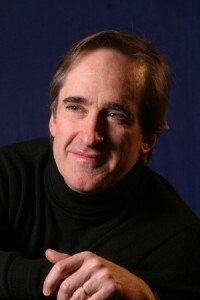 And Bravo times two to the SFS and James Conlon. Before beginning the Sinfonia da Requiem, Maestro Conlon addressed the audience to explain the origin of the composition. The Japanese government sought a European composer to create music for the celebration of the Imperial family’s 2600th anniversary as the ruling dynasty. 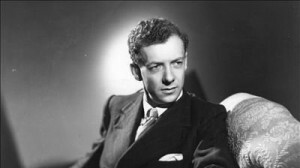 The British Council, cultural arm of British diplomacy, approached Britten. Although Britten had been assured that he need not write nationalistic bombast, the Japanese rejected the Sinfonia. Britten had come to the US in 1939, the fateful, desperate year. Though far away, Britten was deeply distressed by of war across Europe and Asia. James Conlon concluded his remarks by observing that the Sinfonia was a requiem for the culture that was destroyed by the war. His voice caught a bit as he said this; it is plain that Conlon felt deeply the horrors of the war and the permanence of loss. This is a great, surprising work in three movements, each named for Christian liturgy. Lacrymosa, the first, comes from a medieval hymn describing the Day of Judgment: “Lamentable is that day on which guilty man shall arise from the ashes to be judged.” There is nothing comforting about it; it has a driving, percussive force and cries from a saxophone. Without pause, the second movement, Dies irae begins. It is an irregular dance, fast and harsh. One might remember depictions of the dance of death in medieval art, but, sadly, it is not necessary to search art history to find meaningful connections. The final movement’s title, Requiem aeternam, comes from the Mass for the Dead: “Grant them eternal rest, O Lord, and let everlasting light shine upon them.” Phrases for flutes and horns alternate; chords from harps, clarinets and strings build fervently. All grows quieter and fades to eternity. Jan Lisiecki was the soloist for Mozart’s Concerto. 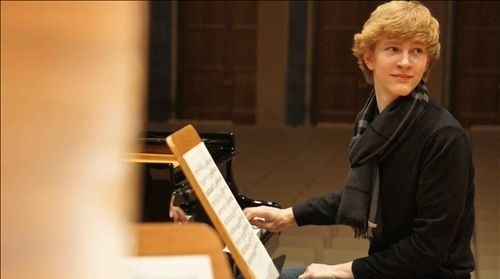 A twenty-one year old phenomenon, his mastery of the lovely Mozart work was secure and admirable. The concerto is notable, in addition to the brilliance of the piano, for the clarinets which Mozart included for the first time in a concerto. This work has everything that delights in a Mozart concerto: complexity of design and also complexity of feeling. While there are dashing themes and splendid allegros, it poses formal, spritely 18th century dances along with the sweetness of life in music. Closing the concert with Dvorak’s 8th Symphony was a gesture of affirmation. It is a compact work which gains power through compression. There are joyful, happy sounds of birds, dance rhythms, music which seems to pour directly from nature. Yet, despite the cheer, there is a sigh of awareness that this beauty is fragile. 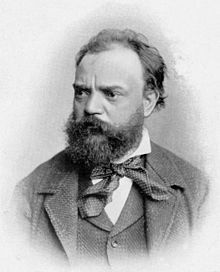 As the last movement, Allegro non troppo, rounds through music of our natural world, the listener senses a smile from Dvorak. There is strife and sadness, but we still enjoy the birdsong. The Hedgehog is grateful to James M. Keller for this quotation from Czech conductor, Rafael Kubelk, when rehearsing this Symphony: “Gentlemen, in Bohemia the trumpets never call to battle–they always call to the dance!” James Conlon is Music Director of the Los Angeles Opera, Principal Conductor of the RAI National Symphony Orchestra, Torino, Italy; he has also been Music Director of the Ravinia Festival and Principal Conductor of the Paris National Opera. He first performed with the SFS, 1978. FOR MORE HEDGEHOG HIGHLIGHTS on Mozart, please see April 26, 2016, Hilary Hahn, violinist, playing Mozart’s Sonata in G maj. K379 (373 a), and Oct. 4, 2015, Andras Schiff, pianist, playing Mozart’s Sonata in D maj. for Piano, K.576. Pictures, from top: James Conlon, Jan Lisiecki, Antonin Dvorak. This entry was posted in Hedgehog Highlights and tagged Antonin Dvorak, Benjamin Britten, Dvorak's 8th Symphony, James Conlon, K. 482 by Mozart, Mozart, Piano Concerto No. 22 in E-flat major, San Francisco Symphony, Sinfonia da Requiem by Britten, Symphony No. 8 in G major by Dvorak on June 25, 2016 by Leslie. The San Francisco Symphony, conducted by Michael Tilson Thomas, brought On The Town to San Francisco, May 25-29, 2016. It was such an upbeat, entertaining performance May 28 when the Hedgehogs were there, the audience left with ear to ear smiles and toes still tapping. The story behind the story could be a Broadway show itself. The ballet, Fancy Free, about three sailors on a one day pass to New York City, was the origin of the show. Oliver Smith, famed stage designer with American Ballet Theater, thought it would make a good show on its own; he advised the composer, Leonard Bernstein, and choreographer, Jerome Robbins, to add script and more music. Bernstein invited his friends, Betty Comden and Adolph Green to write the book and lyrics. Comden and Green also performed two starring roles. The ballet premiered in April, 1944. On the Town opened on Broadway in December. The creative team must have worked full tilt just as the three sailors went after their New York experiences living every moment to the fullest while they could. The show was performed on the SFS’s stage and on a platform above and behind the musicians. The SFSymphony Chorus sang from on high from left and right box seats. Narrow, gray cylinders formed a kind of skyline onto which evocative images were projected: news reels, war ships, the American flag put us in the historic setting. Especially effective were Coney Island images: Ferris Wheel, colors and lights. Michael Tilson Thomas premiered a concert version of On the Town, 1992, with the London Symphony Orchestra. He had written a new edition of the music with Charlie Harmon and David Israel. Comden and Green contributed a new narration. The May performances at SFS were the same version. Performers this spring had appeared in the Broadway revival, 2014. Clyde Alves as Ozzie, the role created by Adolph Comden; Jay Armstong Johnson, Chip; Tony Yazbeck, who won the Astaire award for his Gabey; Megan Fairchild, Ivy; Alysha Umphress, Hildy, Betty Comden’s role. Isabel Leonard who has performed internationally in opera was Claire. They are the legendary triple threat performers of Broadway: they sing, dance, and act. A perfect example is the sailor who performed back to back flips and whipping ballet turns. 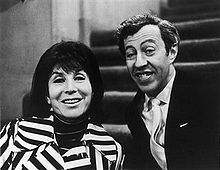 The narrators were David Garrison, an actor with a long list of stage and TV credits, and Amanda Green, the lyricist daughter of On the Town’s lyricist, Adolph Green. Photos from top: Michael Tilson Thomas, Music Director, San Francisco Symphony; Leonard Bernstein; Betty Comden and Adolph Green; Alysha Umphress and Jay Armstrong Johnson as Hildy and Chip in Broadway’s On the Town, 2014. This entry was posted in Hedgehog Highlights and tagged Adolph Green, Amanda Green, Aysha Umphress, Betty Comden, Charlie Harmon, Clyde Alves, David Garrison, David Israel, Fancy Free, Isabel Leonard, Jay Armstrong Johnson, Leonard Bernstein, Megan Fairchild, Michael Tilson Thomas, Oliver Smith, On the Town, San Francisco Symphony Chorus, Tony Yazbeck on June 20, 2016 by Leslie. It’s time! Register for the best summer dance experience at the International Dance Festival@Silicon Valley. Send in the following information by email to livelyfoundation@sbcglobal.net or by US Mail to The Lively Foundation/550 Mountain View Avenue/Mountain View, CA 94041-1941 You may also copy and print the form here. Make your check out to The Lively Foundation. Early Bird prices good through June 30. If you take the Contemporary Wkshop you may perform in the Festival Concert or choose not to perform. If you take Choreo-Cubator© you may perform in the Showcase or choose not to. This entry was posted in INTERNATIONAL DANCE FESTIVAL-SILICON VALLEY and tagged IDF@SV 2016, International Dance Festivial@Silicon Valley, Mountain View dance, Mountain View Masonic Center, registration for summer dance festival, Summer Dance Festival, The Lively Foundation on June 7, 2016 by Leslie.